In this course we discuss how to overcome the challenges to effective strategic planning in a nonprofit organization, in order to enable the executive team and board of directors to appropriately and effectively guide the organization’s future direction. 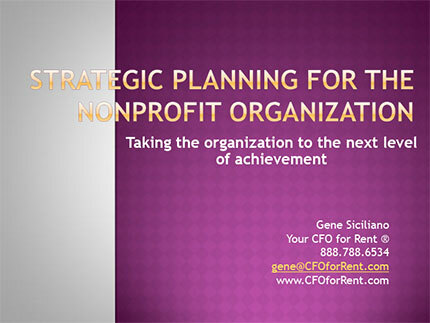 We start by discussing why strategic planning seems to be so difficult for nonprofit boards and management teams. Then we cover Issues like the board’s role, staff/board collaboration challenges, visionary thinking, risk taking and the relationship between strategic plans and day-to-day operations. In this series of short clips from an extensive interview with Entrepreneur.com, Gene discusses the kinds of financial pitfalls entrepreneurs and business owners often overlook as they build their companies. Any of these can dampen profits and cash flow, and over time they can be fatal to the business if not recognized and resolved. Whether you own the business or are running it for someone else, the buck stops with you – sometimes literally! Your decisions are directly tied to the financial success of your company. It’s your responsibility to take your business to the next level. The potential is there, but will you achieve it? "Concise and to the point" – "Amazing class. I learned much about the budgeting routine." 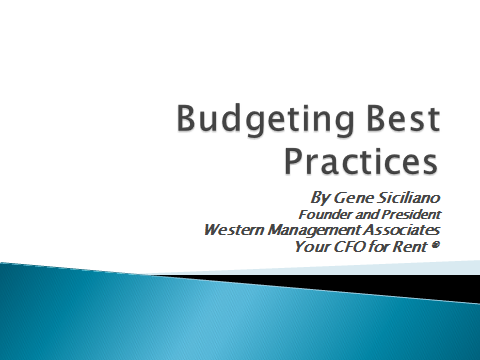 – "good examples and didn't just read the slides" – "easy to understand" – "excellent overview of the budget process" – "Easy to listen to" – "Good summary of three key questions to ask when actual off from budget" – "Great!" – "I liked the course very much, for its clarity in content and succinct delivery" – "organized and summarized well with good tips" – "Hit all the key topics" – "Informative and insightful course on the budgeting process" – "Well taught at an appropriate pace" – "Great course… Could relate a lot of this material to improve our budgeting process."